Happy Monday, Loves! It has been a few weeks since I have put up a good fashion post so here we go! 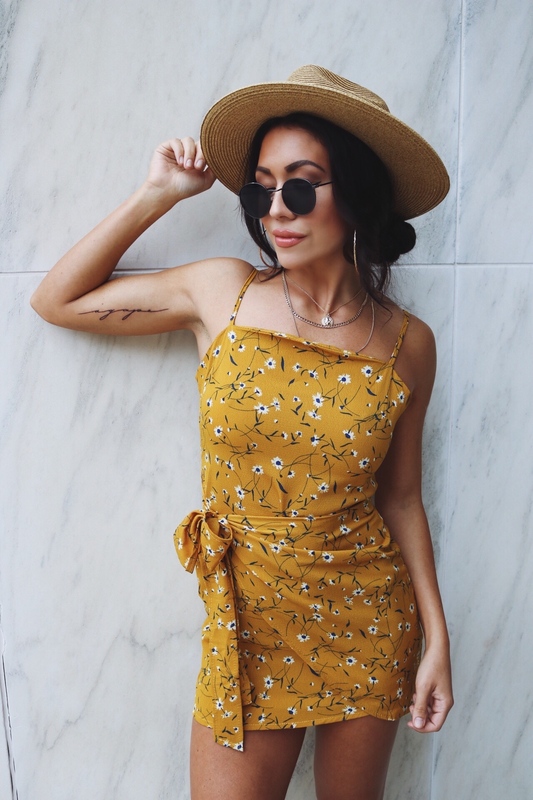 I am lalaloving this wrap dress from SheIn. I love a good mustard color! The wrap dress trend has been one that I am loving for Summer. It is a great trend that is so flattering on any body type. We only have a couple good months of Summer weather left (say what?!) so this Mama is soaking in all the Summer trends while I can! Anyone else sitting there in disbelief that it is August this week? My lanta this Summer has flown! I also have a new addition on my arm that I am really excited to show you all! Keep on reading for a looksie! This dress is on the shorter side, I would have definitely gone up a size. Just something to keep in mind if you plan on purchasing! This jean jacket has been glued to me all Spring and Summer. The wash is my absolute favorite and I love how it compliments any casual outfit. It is super lightweight and such a soft denim. I went up to a size Medium for a more relaxed fit. I found it at Target. I have linked it HERE in a medium wash. The light was appears to be out of stock but I would definitely check your local Target to see if they carry it in store. It is such a good price, too! The wedges I am wearing are also one of my favorite purchases this Summer. They are bit more on the pricey side of what I usually buy, but the quality and comfort is sooo worth it! They come in multiple colors and they do not disappoint! I also did something a little crazy last Friday and I got some ink! The only other tattoo I had was a small infinity sign on my left wrist. I am not a huge tattoo person, but I had this idea for a few months and I just had to do it! I also got two Roman numeral dates on the back side of my arm above my elbow that I will include in another post. The one on my arm says “Agape” which is the word in the Bible used to describe God’s love for us. Agape love is sacrificial love. There are no conditions, no good deeds that need to be done, no anterior motives to receive this love…it is simply loving unconditionally. It is the kind of love I strive to show my family everyday…especially my husband. To love him sacrificially when it is hard to, through the great times, the bad times, and the times I feel I don’t get the same in return. I often think back to my life and decisions I have made and think, “God, why would you still love me? Want me?” It all goes back to that Agape love. There is nothing that I can do that will make God not love me, and the same goes for YOU. I knew I wanted it on my arm from the moment I had the idea for it. I love raising my arms in worship and knowing this tattoo is on my arm now just makes worshiping that much more special for me. I hope you all have a great week! I will be over here just trying to hold on to Summer as long as I can! Make sure to check back in to Vida Noel Wednesday for another Wednesday Wisdom Post!